After an ill-fated start in the mid-Nineties, Gorath only really started in the early years of the new millennium, and which was initially a solo-project by vocalist and bass player F. Dupont, gradually assembled musicians to become a full-fledged band. Unfamiliar with their early works, I can only say that their third longplayer Misotheism is one of the finest statements in black metal of the year. It is common to pigeonhole black metal bands to the either old school or symphonic / melodic branches of the movement, but Gorath prefer to stay clear of both directions with their extremely progressive sound. Their pieces are between six and ten minutes long (except for the shorter Sophia which isn’t exactly a real song), and so full of ideas that every time you can be sure to discover something new. The production is very transparent and powerful, giving more space to the bass guitar than is usual in black metal, so that eventually this sounds like an extreme metal band that has been inspired by many different kinds of hard music. Misotheism stands for the hatred of god(s), which is quite funny because it presumes a belief in god(s). The concept of the album is about heresy as it has been found in different gospels not accepted by official church dogma. All the lyrics have been written by Theudho frontman Jurgen S. The lyrical ambitions are clearly matched, even surpassed, by Gorath’s musical approach which is so fresh and teeming with ideas yet never becomes complex just for complexity’s sake. Long years of experience must have taught the Belgian black metal band to create long tracks that can stand on their own. Misotheism is majestic in scope, but never turns down to cliché. 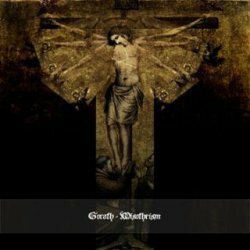 They may be a little too original for genre fans who prefer a copy of what they know, but I expect most people to be grateful for this excellent band that makes black metal again the pioneering movement it was twenty years ago in its early days. If you buy only one black metal record this year, it might as well be this one.